The item in this review was provided for review purposes by Mizzen+Main. Mizzen+Main has three dress shirt lines, Spinnaker, Leeward, and Blue Label. The Spinnaker is their original line, focused on comfort with their highest stretch fabric. Leeward and Blue Label are made from a dressier (but still stretch) fabric, with the Blue Label adding a placket, a pointier collar, and convertible cuffs for the most dressy look. 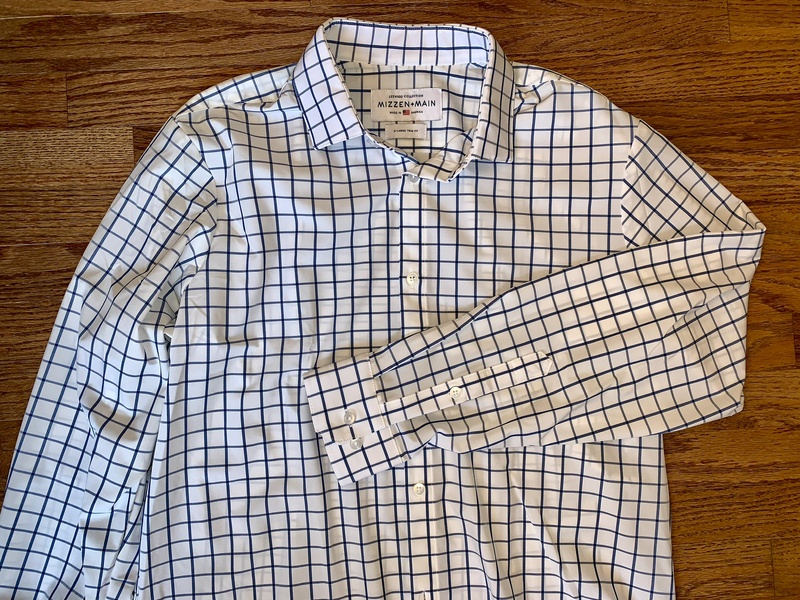 I was able to give the Bowie Navy & White Windowpane shirt from the Leeward line a try. When looking for a performance dress shirt, the look of the fabric is key. The polyester/spandex blend (85%/15%) Mizzen+Main has designed does just that, it looks normal. It drapes nicely and doesn’t have that synthetic sound. Close up, it does have a slight texture but the feel and appearance are smooth. The spandex gives it a noticeable four way stretch and the lightweight nature makes it comfortable in warm weather. However, it is thin enough that I would not wear the white grounded prints without an undershirt. With the three fits offered in this shirt, it should be fairly easy for everyone to find a good fit off the rack. I find it is one of my best fitting shirts. The back darts help to keep from having extra fabric around the waist, and it is long enough to stay tucked in. The spread collar feels just at home with the top button open or with a tie, and removable collar stays keep the collar straight. The only issue I have is how stiff the cuffs are. While nice on the collar, the stiffening material seems a little too much to me for the cuffs. They just hold too much of a crease to look completely normal. 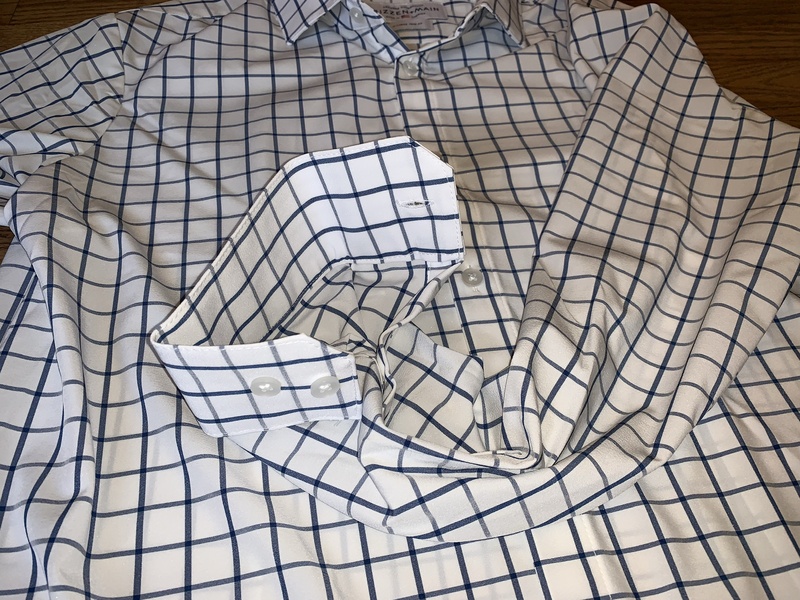 When wearing this shirt, you almost forget you are wearing a dress shirt due to the four way stretch. While some shirts are so stretchy the drape looks off, the sweet spot has been found here. Another key attribute of a good performance dress shirt is its wrinkle resistance — this shirt does a great job. There were some wrinkles out of the package, but a quick steam took care of them. Other than that, I haven’t had any wrinkling issues. After a cold wash, hanging the shirt to dry takes care of all the wrinkles — so much so that it looks as sharp as a pressed shirt. This is something that I do not get with my merino dress shirts. I’ve worn this shirt in the heat and found it to remain comfortable. The lightweight fabric does a good job of keeping you cool while wicking moisture without feeling heavy (since it dries very quickly). The final question — how is the odor resistance? I can get just one or two days from this shirt. Since it is 100% synthetic and has no odor resistant treatment, that should be expected. However, since the fabric dries so quickly and doesn’t seem to pick up wrinkles from washing, you can get multiple wears by hand washing and hanging to dry overnight. I liked this shirt more than I expected. It looks nice, performs well, and is very comfortable. I see this shirt fitting in anywhere you’d normally wear a dress shirt. If you need to dress it up further, I’d take a look at the Blue Label line. While it can’t beat a merino dress shirt in odor resistance, it excels in all other categories — all while looking more formal. I last had a Mizzen+Main shirt from this collection about 18 months ago, but my recollections echo what Steve said above. It surprisingly looks normal and the stretch was stellar. The odor resistance is not there. The collars and cuffs on mine were thicker like Steve notes and I remember that being the most odd part of the shirt. Overall it’s a very good shirt and looks very ‘normal’.